Formal values are personal values. What holds us in a painting or a sculpture is not art history but an individual’s history, some inner necessity or imperative that has been expressed through the forms available at a particular time. There are classicists and there are expressionists in every age, and the twentieth century was no exception. Joaquín Torres-García, Arshile Gorky, and Anne Truitt--the subjects of three important museum retrospectives in recent months--stamp the modern century with their particular, even idiosyncratic views of the modern condition. To speak of Torres-García as a Constructivist, or Gorky as an Abstract Expressionist, or Truitt as a Minimalist, is not so much inaccurate as it is grievously inadequate. The power of their art cannot be separated from the troublesomeness of their relationship to any label, any fixed definition of style; and this holds true even though each artist was intimately involved with the definition of a style. It is the many ways in which these artists fail to fit in that finally command our attention. Their art confounds what many in the twentieth century came to regard, at first for better and as time went on often for worse, as the impersonal forces of history. I have always been uneasy with biological explanations of human behavior. It is at the very least disquieting to find the actions of human beings explained by analogies with the behavior of ants or bees or wolves. And yet I cannot doubt that some kind of herd instinct or groupthink goes a considerable way toward explaining the persistent vision of art history, and especially of modern art history, as a race from one style to another, from Post-Impressionism to Fauvism and Cubism, and then onward to Futurism, Suprematism, Neoplasticism, and Surrealism. Fitting Torres-García, Gorky, and Truitt into such diagrammatic schemes is not easy. Those who take an interest in their work often form opposing camps (which itself suggests a kind of herd instinct), arguing for wildly different ways of locking them into the historical scheme. With Gorky, there is an old argument between historians who see him as a central member of the founding Abstract Expressionist generation and historians who see him as a late-blooming Surrealist. With Torres-García, there are those who see him as essentially a member of the European avant-garde in the late 1920s and early 1930s, a friend of Mondrian, Van Doesburg, and Arp, while others see him as a South American artist, absorbed in indigenous themes, motifs, and attitudes. As for Truitt, the critical writing has located the blunt foursquare shapes of her painted wood constructions among the works of the Formalists and Minimalists of the 1960s, while the three volumes of journals that she published over the years, with their sharply etched reflections on the life of an artist who also happens to be a woman, made her at least for a time something of a figure in feminist circles--and thus, according to some observers, part of an entirely different historical continuum. If none of the categories into which curators, critics, historians, dealers, and collectors have wanted to put these artists exactly fit, it is not because Torres-García, Gorky, and Truitt are outside of history. In the end, each of them has a relationship with the history of his or her time that is entirely his or her own. It was perhaps in response to such confounding questions that Torres-García, living in Paris in the late 1920s and early 1930s, the great age of “isms,” argued that art ought to be understood as an “eternal present.” “Man believes,” he wrote, “that he evolves advancing toward intelligence. I believe the opposite. Man finds his place by moving toward consciousness.” While Torres-García’s metaphysics is not always easy to parse, he seems to suggest a movement that is not forward so much as inward, not historical so much as psychological or spiritual. Modernity for Torres-García--and I suspect also for Gorky and Truitt--is not a matter of ideas or ideals, but of a realization of the self through a process of carpentering together a coherent vision. Mari Carmen Ramírez--who organized the Torres-García exhibition at the Menil Collection in Houston--writes that for Torres-García “‘concrete’ was not the contrary of ‘abstract.’” To conceive an abstract art was to make one’s imaginings real. For Torres-García, Gorky, and Truitt, abstraction may finally be the least abstract thing in the world. Joaquín Torres-García, who was born in 1874 in Montevideo and died there in 1949, was the son of a shopkeeper, originally from Catalonia, who also ran a carpentry business. Torres-García grew up in Uruguay and then near Barcelona, where the family moved when he was young. The works in “Joaquín Torres-García: Constructing Abstraction with Wood,” which is now at the San Diego Museum of Art, might be described as inscrutable products of the carpenter’s workshop: shop signs, game boards, weathervanes, toys, and implements designed not for use by an actual community but for the needs of a dream community, a parallel world of the artist’s invention. For Torres-García, whose primary allegiance was to painting, these simply crafted works suggest the re-imagining, in three dimensions, of the two-dimensional world of his canvases, in which houses, figures, animals, and everyday objects are arrayed in compartmentalized spaces that play on the rectilinear universe of his friend Mondrian. The Torres-García exhibition--which I saw at the Menil in Houston, where the austere installation was as beautiful as any I have ever encountered--reflects an urge not unusual among painters to embrace the literal possibilities suggested by their imaginary volumes. Degas, Picasso, and Matisse are some of the painters who found sculpture irresistible. Going through this show, it is easy to imagine that one is witnessing the birth of sculpture, as Torres-García moves between the most rudimentary incision of a groove in a piece of wood, the cutting of planks into shapes, the nailing of shapes on planks to create shallow reliefs, and the development of freestanding constructions. In everything Torres-García did I feel the force of a sensibility so strong that it becomes a structural imperative. He worked with Gaudí on drawings for the Sagrada Familia in Barcelona in the first decade of the twentieth century. He was a significant figure in the drive toward a new Mediterranean neoclassicism, known in Catalonia as Noucentisme, painting murals of robed muses and muscled workers and publishing aesthetic theory as well. These works are already stamped with the feeling for earthy colors and somber contours that he brings to his abstraction in the 1930s and to a later series of portraits of artist heroes--Goya, Raphael, Titian--in which he milked caricature for psychological truth. He lived briefly in New York in 1920 and 1921, getting to know Duchamp and many members of the American avant-garde. In Paris he was swept up in the experiments of Mondrian and Van Doesburg. And in his later years, in Montevideo, he became an immensely significant force for the acceptance of abstract art in South America, with an influence that was felt long after his death. If Noucentisme endeavored to draw a fresh classicism out of the Mediterranean earth, there was perhaps no artist who brought to this task more heartfelt conviction than Torres-García. His ochres, siennas, and grays--which from time to time achieve a mineral brilliance, approaching Mondrian’s iconographic red, yellow, and blue--are protagonists in the drama of his art, not a means to an end but ends in themselves. His colors are emblematic, symbols of earth, stone, water, fire. His lines, whether drawn in paint or incised in wood, suggest humankind’s first pictographs, the shape of a temple or a god, drawn with a stick on the sand as the water laps at the ancient artist’s feet. At the Menil I felt how strongly this classicism is grounded not in the ideas of some architect or artist, whether Vitruvius or Mondrian, but in the primacy of craft. To the extent that Raphael, Poussin, Puvis de Chavannes, and Mondrian were a stimulus for Torres-García, their work emboldened him to re-imagine the origins of classicism. The fundamentalism of Torres-García’s art reminds me of the old Greek story of the maiden who, in tracing the shadow of her departing lover’s profile on a wall, invented the art of painting. One can imagine Torres-García discovering the origins of sculpture in a cutout of a fish, perhaps sawn from a piece of wood in his father’s carpentry shop and meant to hang above the door of a fishmonger’s place in a Catalan village. The fundamental and the transcendental are all mixed up in Torres-García’s art. In the 1920s he designed wooden toys, figures made of a few blocky forms, some of which were actually put into production. They are not entirely different from some of the constructions that he regarded as freestanding works of art. His art exists in a psychic region where the child and the artist merge, where play and creation cannot entirely be disentangled. It was in 1938 that Johan Huizinga published Homo Ludens: A Study of the Play-Element in Culture, a book that has yet to be considered in relation to the art of its day--to Torres-García, to Calder, to Miró. Torres-García created a quotidian classicism. His search for an exactly shaped naïveté paralleled the work of Gertrude Stein, Satie, and Miró. The use of previously non-art craft techniques for high-art ends--collage, welded metal, or, in Torres-García’s case, carpentry--puts us on notice that art is literally beginning again. The drama is in the exquisiteness of the sensibility that attends to this rough-hewn stuff--as fine, if not finer, than that of a master jeweler concocting Fabergé eggs. What keeps Torres-García’s work from preciosity, from a facile charm, is the pressure that he imposes on blunt fact. 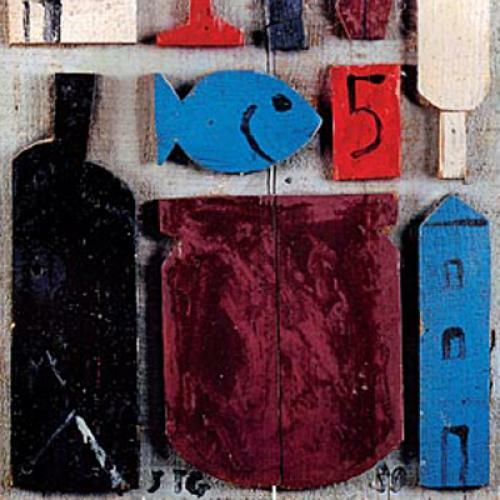 In the beautiful Superimposed Colored Objects, from 1930, fourteen differently colored objects are arranged on a gray board, and it is the syncopation of their relationships that gives these elemental icons--the blue fish, the red goblet, the white house, the brown man, the black key--their scrupulous inscrutability. While the stories that Torres-García tells are not always easy to understand, their general drift is unmistakable. He spoke of his art as Constructive Universalism, and what he invariably reveals is a meandering story of travel and arrival, man and home, sustenance and celebration, with the clock faces that are one of his favorite motifs ticking off the hours and the days. I cannot imagine a more perfect setting for the exhibition than the Menil Collection, which even now, more than a decade after the death of Dominique de Menil, still reflects her grandly intransigent vision. Here the public is invited to explore the intricacies of the modern sensibility: nothing is dumbed down, nothing is explained away. Dominique de Menil and her husband John de Menil were much interested in the relationship between modern art and Catholicism, and had their own exceedingly unconventional views of the spirit and the flesh. In the fragmentation, reductionism, and absurdism of twentieth-century art, they found responses to some of the oldest questions posed by Christianity. Torres-García’s work resonates in this context. Although I would not go so far as to see his goblets and fish as exactly Christological, there is surely an aura of the transcendent about Torres-García’s secularism, with its dreams of an ideal society. Is the artistic personality always characterized by some especially intense combination of susceptibility and imperviousness? In the case of Torres-García, some such mix of powers helps to explain how he could remain absolutely himself as he moved from Neoclassicism to Constructivism. And a similar intensity characterizes the art of Arshile Gorky, who died a year before Torres-García, but was a much younger man, only in his mid-forties, driven to suicide by a battle with cancer, a catastrophic studio fire, injuries from a car crash, and deepening marital troubles. As is often the case with creative spirits who die before their time, Gorky became a hallowed figure among the friends who remembered him as they grew older. They included Meyer Schapiro, Harold Rosenberg, and Julien Levy, his dealer in the 1940s, whose Memoir of an Art Gallery closes with Gorky’s last years and death. What all of them write about is not so much the style of Gorky’s art, which until close to the end remained intimately linked with the styles of other artists, but the force of his character--a mingling, again, of susceptibility and imperviousness--that gave even his closest essays in the styles of others an autonomous power. By the later 1950s, the artists who had been Gorky’s contemporaries were recognized around the world by their signature styles. And in the face of Newman’s zip, Pollock’s drip, and Rothko’s soft rectangles, Gorky’s infinitely subtler signature served to remind people of a different kind of artistic authority. In the Gorky retrospective, this authority seems to rest, more than anywhere else, in his tremendous gifts as a draftsman, whether on paper or on canvas. (The exhibition was organized by Michael R. Taylor at the Philadelphia Museum of Art, where it was seen last fall; it is now at Tate Modern in London and travels to the Museum of Contemporary Art in Los Angeles for the summer.) From the studies for the two paintings of The Artist and His Mother, begun in the 1920s, through the biomorphic still lifes of the 1930s, it is in drawings, whether in pencil or in ink, that I feel something immediate and personal. The exactitude of Gorky’s line is not entirely original. Picasso and Miró, a generation earlier, were the first artists who used the Neoclassical line, with its razor-sharp astringency, to achieve abstract ends. What is new with Gorky is some quality of treasuring that line, of lingering over it, of treating it as a force in itself. When he decisively inks the edge of a form, or when he works criss-crossing lines to create areas of deeply hatched texture, he seems perhaps more in love with the process than Picasso or Miró ever (or at least generally) was, he is celebrating the beautifully finished or polished line as a source of artistic power. Gorky is absorbed not in drawing as an end but in drawing as a means. And it is only in the early 1940s, when he finally allows himself to conceive a painting as an extended drawing, open and speculative in the way a drawing can be, that Gorky finds himself as an artist. Everybody agrees that the appearance in New York by the early 1940s of artists in exile from wartime Europe, especially the Surrealist Matta, had a liberating effect on Gorky, who found in the younger Matta, as Schapiro later said, “a brother rather than a father”--and a brother who was close at hand, as brothers ought to be. Matta’s slender lines, drawn with paint on canvas, limning curious evolutions and eruptions, by turns dreamy and disturbing, were something that Gorky rapidly made his own. Living much in the country in the 1940s, observing the grasses and the leaves up close, as if he were a latter-day Dürer, Gorky found his way to a world of burstings, meltings, glowings, and burnings--an abstract pastoral, in some respects not all that far from Kandinsky in the years before and during World War I and from Miró’s most oddball and spirited works of the 1920s. What was fresh in Gorky’s work was his insistent hesitation in the face of any idea of the finality of oil painting. He embraced incompleteness and unfinishedness not as a temporary experiment, as it was for Picasso or Matisse, but as a permanent state of affairs. In the rooms in Philadelphia dedicated to the works of the 1940s, I repeatedly found something beautifully solipsistic about Gorky’s painting. He paints in all sorts of different ways--thin or thick, with washes and opacities, with apparent brushstrokes or hidden brushstrokes--and each time it is speculative, a provisional response to the armature of drawing, which even when fully covered remains somehow there. In the abstracted gardens of his later art--whether they are full of young spring colors, strong summer ones, or charred and bleached winter ones--the equivocations and evasions of the paint handling embody the enigmas of nature, the never entirely predictable patterns of growth and decay, the sudden appearance of new life, the equally quick eviscerations. It is all there in his titles: Cornfield of Health, Water of the Flowery Mill, One Year the Milkweed, Scent of Apricots on the Field, Apple Orchard, The Plow and the Song. I did not find this exhibition as satisfying as the retrospective of Gorky’s drawings that was at the Whitney Museum in New York in 2003. Gorky never entirely closes the deal in his paintings--he will never quite allow a painting to become a world with its own laws and logic, its own inevitabilities and irresolvable conflicts. He is always speculating about the possibilities of painting. It is moving to find him, at the very end of his life in Dark Green Painting, still developing his canvases from full-drawn studies, which he meticulously squares up and transfers to canvas, a method of the Old Masters that places Gorky at a great distance from what has been said to be the improvisational methods of the Abstract Expressionists. My feeling is that by the 1940s the method of squaring off a drawing and transferring it to canvas had for Gorky its own graphic pleasure--a cultural drama associated with the Old Masters, to be contrasted with the dreamy Surrealism of his pastoral visions. Gorky’s view of nature was fueled, first and last, by his interest in the art in the galleries and the museums, and not only the art of Picasso and Miró and Kandinsky. Harold Rosenberg recalled, in his little book about Gorky, “the astonishment he aroused among Social Realists and Abstractionists alike when in a slide-lecture at the Artists Union in ’36 or ’37 he flashed on the screen, to illustrate a point about contemporary painting, the dragon wings and armor of a detail of an Uccello.” Gorky himself speaks of the beauties of Persian patterns in a letter collected in a new volume, Goats on the Roof: A Life in Letters and Documents, edited by Matthew Spender. What holds finally in Gorky is the ardor of the eternal student, a besottedness with the idea of form rather than with any particular forms. Although he was in his forties when he died, his painting still had some of the speculative spirit of a man in his twenties. His art only grew younger as he grew older. The extent to which a reputation almost invariably involves misrepresentation, a struggle between official formulas and personal formulations, threatens to distort our understanding of Gorky and Torres-García, and the same danger is certainly a factor in the career of Anne Truitt, who died in 2004 in Washington, where she had lived most of her life. Truitt’s work is sui generis; it is not even clear if it is painting or sculpture. Her slender columnar forms, elongated rectangular volumes six or seven feet high or so, were made by a carpenter and then painted by Truitt in rich, surprising colors. In the retrospective organized by Kristen Hileman that was at the Hirshhorn in the fall, the gatherings of columns looked beautiful, but the presentation was not decisive enough to rescue Truitt from the controversies that have gathered around her work since it was first shown in New York in the 1960s, and became a pawn in a battle waged between the rival styles and schools of those years. Was Anne Truitt a pioneering Minimalist? Or was she a faux Minimalist, as the sculptor Donald Judd, who was writing a good deal of criticism at the time, suggested? Or was she the anti-Minimalist answer to Minimalism, as Clement Greenberg, who was a sometime supporter, believed? These battles can feel rather antiquated now, the arguments of another generation. If you were to set one of Truitt’s columns next to one of Judd’s multi-colored aluminum boxes from the 1980s, they would make a lot of sense together. But neither the art historians nor the art dealers, for their somewhat different reasons, are ready to give up on the partisan battles of an earlier era. For the secondary market in mid-twentieth-century art, which is practically out of Abstract Expressionist stuff to buy and sell, the sleek art of the 1960s and 1970s is definitely a growth industry, and Truitt fits right in. The fact that Judd took the trouble to dislike Truitt aggrandizes her position, as does the fact that Greenberg wrote an article about her in Vogue in 1968. Truitt was in her early forties when she began to make the painted boxes that are her signal achievements. A visit to the Guggenheim’s show “Abstract Expressionists and Imagists” in 1961 is said to have been a turning point for her, with Reinhardt’s dark color orchestrations and Newman’s enigmatic zips releasing her to go her own way. By 1963, she was showing at the André Emmerich Gallery, along with many of the movers and shakers of the moment. The Hirshhorn retrospective begins with that moment. It makes Truitt into a 1960s person, which is a fashionable thing to be. Perhaps Truitt herself did not want it understood that she had been attracted to austere rectilinear forms even earlier, as we can see from a lost piece illustrated in the catalogue, Painted Wire Construction, from 1952. This work suggests an interest in a Constructivist tradition that extends back to the very beginning of the century. And Truitt is aware that this tradition extends even further back. After visiting the Pieros in Arezzo, she wrote in one of her journals, “I humbly recognized in a background view of Jerusalem in Legend of the True Cross the direct line between Piero and my debt to him: towers of color.” Truitt’s speaks of being “aligned” to Piero, which echoes Gorky’s talk of being “with” Cézanne or Picasso. It is a matter of intimacy rather than influence. The need that some critics and historians feel to locate her in the ideology of a particular time and place is ironic, because there could hardly be a less ideological artist than Truitt. Her interest is in a timeless lyricism--a contemplative poetry derived from the discipline of asceticism, and perhaps fueled by some years she spent in Japan. For Truitt, the column may have something like the function that the sonnet form has for a poet: a form so ancient and so resonant as to be susceptible to infinite variations. Though she worked in a variety of formats, sometimes with slab-like shapes and sometimes with her columns incorporating asymmetries of one sort or another, by and large the most effective works are the ones where the basic shape stays basic. Moving around these tall, slender, four-sided volumes, we are constantly confronted by unexpected shifts in color. Nearly every edge is a hard edge, which only underscores the variety she achieves, sometimes carrying a horizontal band of color around the four sides, often giving the top or the bottom of a column a grace note in a different hue. Truitt understands the sensuousness of color, its power to be luxuriant, seductive, hedonistic. Her deep purples and verdant greens and lush oranges, presented on different sides of her columns, or in contrasting blocks and stripes, are so playful, so immediate, as to suggest the formalization of informal feeling. The color on some columns is light and clear, like an early morning optimism. Others are dark nighttime visions. Sometimes she spins a romance of the tropics, sometimes she alludes to the steady light of the Transcendentalists. And there is a particular pleasure in seeing these columns grouped together, so that they create families of complex forms, a forest of emotions. Truitt emerged at a time when Formalism was the reigning orthodoxy in the art world, and without the support of Formalist critics, she probably would not have had much of a career. But she knew that the Formalists could not really explain her work. I think it was in order to frame her achievement in a way that made more sense to her that she wrote and published, beginning with Daybook in 1982, a series of journals in which she discussed not only her work, but also her children and her grandchildren, her husband and their divorce, her money worries and her teaching jobs and her travels. There is an exactitude about these writings that somehow parallels the exactitude of her columns, with the relative emotional openness of the journals offering a dialectical riposte to the emotional reticence of the sculpture. What is astonishing, in turning from the sculptures to the books, is that the artist and the writer are absolutely one, the same personality expressed through radically different media. When Truitt writes of “blazing yellow maple leaves against an enamel-blue sky, heraldic colors as compelling as a bugle call,” we might as well be looking at one of her columns. And as you read on, the connection only becomes stranger and deeper. Writing during a visit to Bryn Mawr, where she had gone to college, she reveals the feeling behind her impersonal columnar forms. “Like all love,” she observes about her love for the college, “it touched me by way of enchantment, a spell that has lasted in the form of gratitude for the spine of discipline along which I have worked ever since.” The spine of discipline is a statement about personal attitude, personal belief. But it can also be taken as a statement about the columns, with the spine of discipline that is their tall, right-angled shape, against which Truitt works her dreamy, fantastical colors. Truitt’s sculpture underscores the extent to which formal values are personal values. Her work is austere, stripped of allusive content, but at the same time highly idiosyncratic, poetically rich and romantic. I saw this retrospective in Washington on the same day I saw the Gorky exhibition in Philadelphia, not too long after seeing the Torres-García show in Houston, and in each artist I found a seeker after the new, a fervent modernist who was also in certain respects a modern contrarian. None of them had any interest in the twentieth-century fascination with the annihilation of the self, with the idea of modernism as a subsuming of the individual in some form of impersonality. With Torres-García and Truitt, impersonality is always a foil for the free exercise of sensibility, while Gorky becomes only more personal and more idiosyncratic as he goes along. The great interest of Torres-García, Gorky, and Truitt now, ten years into the century after the modern century, resides in their ability to assess their own condition within the modern condition--to be modern, but with a difference. The idea of the modern movement as a matter of falling dominoes and historical flowcharts has nothing to do with what twentieth-century art meant to these artists. Rosenberg said that in Gorky’s later work the “derivations from other painters do not cease; one might say that influences flow into him more freely than before. The difference is that they descend to the drawing board by way of the hand rather than the head.” Everything becomes a matter of craft, of artistry--a process that is intimate, ahistorical. For Torres-García, Gorky, and Truitt, there is no “use by” date on modern art. These artists are modernists with old souls. But isn’t that what we all are today? Jed Perl is the art critic of The New Republic.